If your small to medium sized business is looking for a dependable and durable biometric time attendance system that includes everything you need to go right from the box, then take a good look at theFingerTec® TA100 Fingerprint Series Time & Attendance System. The FingerTec® TA100 series offers "touch-and-go" service with its powerful one-to-many identification. Verify a user with only a touch on the sensor. No need for employee identification numbers or time clocking cards. Users simply verify their enrolled fingerprint in less than 2 seconds, making the FingerTec® TA100 series an effective time and attendance system for any office and factory environment. The simplicity of the FingerTec® TA100 series extends to its management system. Download data from FingerTec® TA100 series readers into Windows based Time Control Management System (TCMS) V2 software, for desgining, viewing, and generating useful reports. You can easily manage data from FingerTec® TA100 series readers via a PC to measure employee performance. FingerTec® TA100 series fingerprint techonolgy ensures data accuracy, eliminating false claims and "buddy-punching", while facilitating punctuality and productivity. 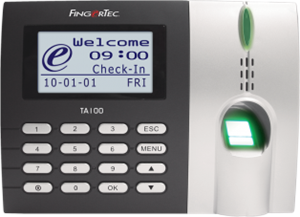 The FingerTec® TA100 Fingerprint Series Time & Attendance System simplifies your time clocking process while providing the efficiency you need to manage your human resources!